Will “Data” blow up in the hands of the operators? I was having a nice chat with my colleagues about the data explosion trend taking place across most of the telecom operators in Europe, US and Asia, when we fell onto an interesting question that was: Can the huge data increase blow up and turn into a serious issue for telecom operators? How can an explosive growth be something negative?, I asked myself. Let’s look into some facts and numbers. Global mobile data traffic grew 2.6-fold in 2010, nearly tripling for the third year in a row. The 2010 mobile data traffic growth rate was higher than anticipated. Last year’s forecast projected that the growth rate would be 149 percent. This year’s estimate is that global mobile data traffic grew 159 percent in 2010. Last year’s mobile data traffic was three times the size of the entire global Internet in 2000. Global mobile data traffic in 2010 (237 petabytes per month) was over three times greater than the total global Internet traffic in 2000 (75 petabytes per month). Mobile video traffic will exceed 50 percent for the first time in 2011. Mobile video traffic was 49.8 percent of total mobile data traffic at the end of 2010, and will account for 52.8 percent of traffic by the end of 2011. Mobile network connection speeds doubled in 2010. Globally, the average mobile network downstream speed in 2010 was 215 kilobits per second (kbps), up from 101 kbps in 2009. The average mobile network connection speed for smartphones in 2010 was 1040 kbps, up from 625 kbps in 2009. The top 1 percent of mobile data subscribers generate over 20 percent of mobile data traffic, down from 30 percent 1 year ago. According to a mobile data usage study conducted by Cisco, mobile data traffic has evened out over the last year and now matches the 1:20 ratio that has been true of fixed networks for several years. Similarly, the top 10 percent of mobile data subscribers now generate approximately 60 percent of mobile data traffic, down from 70 percent at the beginning of the year. Average smartphone usage doubled in 2010. The average amount of traffic per smartphone in 2010 was 79 MB per month, up from 35 MB per month in 2009. Smartphones represent only 13 percent of total global handsets in use today, but they represent over 78 percent of total global handset traffic. In 2010, the typical smartphone generated 24 times more mobile data traffic (79 MB per month) than the typical basic-feature cell phone (which generated only 3.3 MB per month of mobile data traffic). Globally, 31 percent of smartphone traffic was offloaded onto the fixed network through dual-mode or femtocell in 2010. Last year, 14.3 petabytes of smartphone and tablet traffic were offloaded onto the fixed network each month. Without offload, traffic originating from smartphones and tablets would have been 51 petabytes per month rather than 37 petabytes per month in 2010. Android approaches iPhone levels of data use. At the beginning of the year, iPhone consumption was at least 4 times higher than that of any other smartphone platform. Toward the end of the year, iPhone consumption was only 1.75 times higher than that of the second-highest platform, Android. In 2010, 3 million tablets were connected to the mobile network, and each tablet generated 5 times more traffic than the average smartphone. In 2010, mobile data traffic per tablet was 405 MB per month, compared to 79 MB per month per smartphone. There were 94 million laptops on the mobile network in 2010, and each laptop generated 22 times more traffic than the average smartphone. Mobile data traffic per laptop was 1.7 GB per month, up 49 percent from 1.1 GB per month in 2009. Nonsmartphone usage increased 2.2-fold to 3.3 MB per month in 2010, compared to 1.5 MB per month in 2009. Basic handsets still make up the vast majority of devices on the network (87 percent). Conclusion: The explosive growth in data usage in the last year left estimations underestimated. Capacity has been seriously affected as a result of this explosion and the trends seen in data services usage reveal the current monthly data traffic will keep on growing insanely. Insanely? Let’s look at what the future holds for telecom operators. Global mobile data traffic will increase 26-fold between 2010 and 2015. Mobile data traffic will grow at a compound annual growth rate (CAGR) of 92 percent from 2010 to 2015, reaching 6.3 exabytes per month by 2015. There will be nearly one mobile device per capita by 2015. There will be over 7.1 billion mobile-connected devices, including machine-to-machine (M2M) modules, in 2015-approximately equal to the world’s population in 2015 (7.2 billion). Mobile network connection speeds will increase 10-fold by 2015. The average mobile network connection speed (215 kbps in 2010) will grow at a compound annual growth rate of 60 percent, and will exceed 2.2 megabits per second (Mbps) in 2015. Two-thirds of the world’s mobile data traffic will be video by 2015. Mobile video will more than double every year between 2010 and 2015. Mobile video has the highest growth rate of any application category measured at this time. Mobile-connected tablets will generate as much traffic in 2015 as the entire global mobile network in 2010. The amount of mobile data traffic generated by tablets in 2015 (248 petabytes per month) will be approximately equal to the total amount of global mobile data traffic in 2010 (242 petabytes per month). The same will be true of M2M traffic, which will reach 295 petabytes per month in 2015. The average smartphone will generate 1.3 GB of traffic per month in 2015, a 16-fold increase over the 2010 average of 79 MB per month. Aggregate smartphone traffic in 2015 will be 47 times greater than it is today, with a CAGR of 116 percent. By 2015, over 800 million terabytes of mobile data traffic will be offloaded to the fixed network by means of dual-mode devices and femtocells. Without dual-mode and femtocell offload of smartphone and tablet traffic, total mobile data traffic would reach 7.1 exabytes per month in 2015, growing at a CAGR of 95 percent. The Middle East and Africa will have the strongest mobile data traffic growth of any region at 129 percent CAGR, followed by Latin America at 111 percent and Central and Eastern Europe at 102 percent. The mobile network will break the electricity barrier in more than 4 major regions by 2015. By 2015, 4 major regions (Sub-Saharan Africa, Southeast Asia, South Asia, and the Middle East) and 40 countries (including India, Indonesia, and Nigeria) will have more people with mobile network access than with access to electricity at home. The off-grid, on-net population will reach 138 million by 2015. Conclusion: Data traffic is the future business to manage, and there’s a bright business for mobile operators… but is this business opportunity that interesting? Let’s see. Having considered the facts, here’s the problem: Mobile data traffic is growing faster than revenues. As simple as that. Revenue is not growing fast enough to ensure profitablity. Not only is th emobile data traffic growing much faster that revenues, but the revenue growth also trends to decline over the next years. Up until 2007-08, mobile data was a relatively small contributor to both the costs and the revenues for majority of the operators. In fact the margins were fairly healthy and the overall traffic from data was a small fraction of the overall network traffic. However, with the advent of the iPhone and other smartphones, the mobile data traffic and the cost and revenue from data started to ride on the hockey stick curve that we are witnessing today. At a global level, global data traffic went past the voice traffic in 2010 in most of the main telecom markets worldwide. This is obviously having an impact on the margins, as the cost to support such a surge is not in equilibrium with the revenues from such traffic and usage. If we look at the data consumption trends in over 45 countries we see that in most nations (especially Western Europe and North America), the ratio of % data traffic to % revenue is big-time out of equilibrium having a huge negative impact on the margins. As an example, in the US, in 2007, data accounted for 17% of the revenues and 29% of the traffic. By 2011, the data will account for 34% of the revenues but 90% of the traffic. Similarly, for Vodafone Europe, the data traffic % grew from 48% in 2008 to 77% in Q1 2010 while the corresponding data revenue % grew from 24% to 28%. Does anyone doubt that this is just the beginning? What’s crystal clear for most of the industry experts is that most of the operators will start falling in the 75%+ data traffic category and if they are not careful, it can quickly become a big problem for user experience, competitiveness, and ultimately the financial viability of data services. 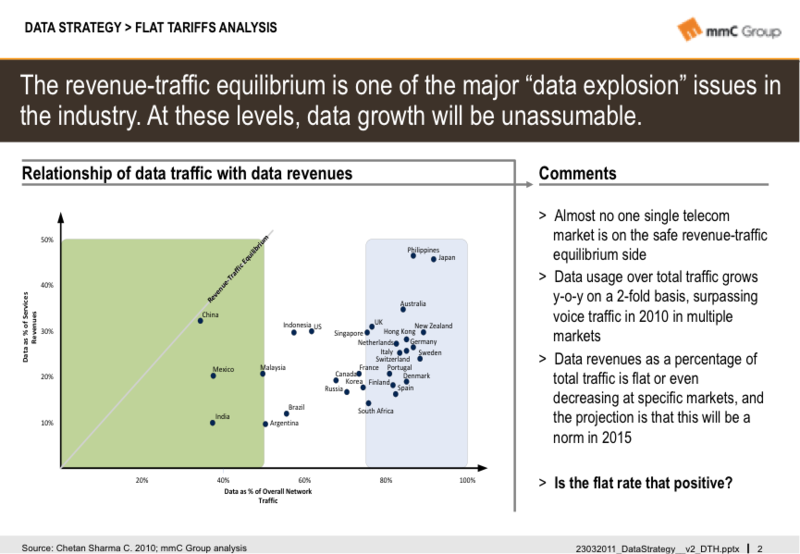 Doesn’t the revenue/traffic equilibrium graph indicate that there is a fundamental pricing problem (not capcity) in the industry? Perhaps the shift from (analog-priced) voice (and sms) to pure (digital) data is a chasm the monopoly carriers are loathe to cross? Is the retail price of bandwidth 20x the economic cost? Isn’t that the real wifi-offload issue and potential disruption for the carriers? Please note that none of this would be discussed today if Jobs had not insisted on a Wifi offload capability in the iPhone and AT&T (unwillingly?) acquiesced.